Continental Airlines ( ) is a United States certificated air carrier. Based in Downtown Houston, Texas , it is the fourth-largest airline in the US based on revenue passenger miles. Since 1998, Continental's marketing slogan has been "Work Hard, Fly Right." Continental operates flights to destinations throughout the U.S., Canada, Latin America, Europe, and the Asia-Pacific regions. Together with its subsidiaries it has more than 4,000 daily departures, serving 133 domestic and 132 international destinations and has 43,246 employees (as of June 2009). Principal operations are from its three hubs at Newark Liberty International Airport (in Newark, New Jersey ), George Bush Intercontinental Airport (in Houston, Texas ), and Cleveland Hopkins International Airport (in Cleveland, Ohio ). Continental Micronesia, a wholly owned subsidiary, operates routes around Micronesia from its hub at Antonio B. Won Pat International Airport in Guam and connects the Micronesian region with destinations in East Asia, Southeast Asia, Honolulu and Cairns, Australia . Continental Airlines is a minority owner of ExpressJet Airlines, which operates under the trade name Continental Express but is a separately managed and publicly-traded company.Chautauqua Airlines also flies under the Continental Express identity, and Cape Air, Colgan Air, CommutAir, and Gulfstream International Airlines feed Continental's flights under the Continental Connection identity. Continental does not have any ownership interests in these companies. Continental left SkyTeam on October 24, 2009 and joined Star Alliance on October 27, 2009. Continental Airlines began service in 1934 as Varney Speed Lines (named after one of its initial owners, Walter T. Varney, who was also a founder of United Airlines) operating out of El Paso and extending through Albuquerque , Santa Fe , and Las Vegas, NM to Pueblo , CO. The airline commenced operations with the Lockheed Vega, a single engine plane that carried four passengers. The airline later flew other Lockheed planes, including the Lockheed L-9 Orion, the Lockheed Electra Junior, and the Lockheed Lodestar. Following cancellation of all domestic airmail contracts by the Roosevelt administration in 1934, Robert Six learned of an opportunity to buy into the Southwest Division of Varney Speed Lines, which needed money to handle its newly-won Pueblo-El Paso route. Six was introduced to Louis Mueller (who would serve as Chairman of the Board of Continental until February 28, 1966). Mueller had helped found the Southwest Division of Varney in 1934 with Walter T. Varney. As an upshot of all this, Six bought into the airline with $90,000 and became general manager on July 5, 1936. Varney was awarded a 17-cent-rate airmail contract between Pueblo and El Paso; it carried passengers as a sideline. The carrier was renamed Continental on July 8, 1937. Six relocated the airline's headquarters to Denver Union (later Stapleton) Airport in Denver in October, 1937. Robert F. Six was one of the colorful group of innovators, pioneers, and visionaries (including Juan Trippe, William A. Patterson, Jack Frye, C.R. Smith, and Eddie Rickenbacker) who established and built the U.S. airline industry. Throughout his life, Six had a reputation as a combative and risk-taking executive who presided forcefully over the airline that was largely forged in his image for more than 40 years. During World War II Continental's Denver maintenance facilities became a conversion center where the airline converted B-17s, B-29s and P-51s for the United States Army Air Force. Profits from military transportation and aircraft conversion enabled Continental to contemplate expansion and acquisition of new aircraft types which became available following the war. Among those types were the DC-3, the Convair 240 and the Convair 340. Some of the DC-3's were acquired as surplus military aircraft following World War II. The Convairs were the first aircraft operated by Continental that were pressurized. The airline's early route network was limited to the original El Paso to Denver route, with routes being added during the Second World War from Denver and Albuquerque across Kansas, Oklahoma, and Texas. By 1946 Continental had expanded new routes from Denver to Kansas City and to Tulsa /Oklahoma City , and from El Paso and Albuquerque to San Antonio . Each of these routes included intermediate stops in several of 22 smaller cities. In 1953 Continental achieved its first major expansion by merging with Pioneer Airlines, gaining access to 16 additional cities in Texas and New Mexico . These Pioneer destinations integrated well with the Continental's post-World War II routes, and provided impetus for the Civil Aeronautics Board (CAB), the industry regulator, to subsequently streamline CAL's routes from Denver to the principal traffic points in Texas, New Mexico, Kansas and Oklahoma. However, Continental was, like most U.S. carriers of the day, essentially a limited regional operation. Bob Six was highly dissatisfied with this situation. He vigorously petitioned the CAB for longer haul routes to larger cities, a part of his plan to transform the regional into a trunkline like United, TWA, and American. Simultaneously, he was quietly discussing with Boeing for Continental to become one of the first among the world's airlines to operate the soon-to-be-launched 707 jet aircraft. The timing was crucial, since the new routes would justify the 707s, and vice versa. By the end of the 1950s, Six's strategy had succeeded. Continental Airlines had seen a broad expansion of its routes, thanks to a responsive CAB and persistent efforts by Six, who frequently referred to his company as, "the Airline that needs to grow." In 1957 it flew for the first time from Chicago to Los Angeles (both nonstop, and via Denver ); and non-stop from Denver and Los Angeles to Kansas City . Continental Airlines introduced turboprop service with the Vickers Viscount, on the new medium haul routes. The CAB permitted Continental to drop service at many of the smaller cities on the system, enabling the carrier's new aircraft to operate more economically between points with longer lengths-of-haul. Prior to the introduction of its Boeing 707 jets, Continental acquired the popular DC-7s to operate its non-stop route from Los Angeles to Chicago, as well as Denver-Los Angeles and Chicago-Kansas City (see photos). During the late 1950s and early 1960s, Six clearly established himself as the airline industry's leading lower-fare advocate. He correctly predicted that increased traffic, not higher fares, was the answer to the airline industry's problems. Six stunned the industry when he introduced the economy fare on the Chicago -Los Angeles route in 1962. He later pioneered a number of other low or discount fares which brought air travel to many who otherwise could not have afforded it. One of Continental's early innovations was a system-wide economy excursion fare which cut the standard coach fares by more than 25 percent. As Six had planned, Continental was one of the earliest operators of the Boeing 707, taking delivery of its first of four 707s in spring of 1959. Although Pan Am and TWA inaugurated 707 service a few weeks before Continental did, Continental was the first airline in the world to widely use the Boeing 707 in domestic service, first utilizing the type on the Chicago -Los Angeles nonstop route on June 8, 1959. However, because Continental's 707 fleet was small relative to other carriers, it required radical innovations to the 707 maintenance program. To maintain its small jet fleet Continental developed an industry first: the innovative "progressive maintenance" program enabled Continental to fly its 707 fleet seven days a week, 16 hours a day, achieving greater aircraft utilization than any other jet aircraft operator in the airline industry. Six, not being satisfied with 707 service alone, introduced exclusive innovations and luxe cuisine with Continental's 707 operations which were described as, "...nothing short of luxurious" by the Los Angeles Times, and, "...clearly, the finest in the airline industry" by the Chicago Tribune. Beginning in the early 1960s Continental added routes from Los Angeles to Houston , both nonstop and with 1- and 2-stop services to Houston via Phoenix , Tucson , El Paso , Midland-Odessa, Austin , and San Antonio . New service was also inaugurated from Denver to Seattle , Portland , New Orleans , and Houston (to Houston: both nonstop, and with 1- and 2-stop services via Wichita /Tulsa /Oklahoma City ). In 1963 the company's headquarters were moved from Denver to Los Angeles . During the late 1960s, the company disposed of the last of its turboprop and piston powered aircraft—one of the first U.S. airlines to do so. Continental replaced the Viscount fleet with DC-9s from Douglas Aircraft and began an aggressive acquisition of Boeing 727 aircraft. These two types (DC-9 and B-727) were to become the workhorses of the Continental fleet from the late 1960s, and for the next twenty years. The DC-9's were phased out and by the mid to late seventies, Continental used the 727 for its narrow body fleet. In 1968 a new systemwide Continental Airlines livery was launched, the orange and gold cheatlines adorned with a black "jetstream" logo (by Six's friend, the noted graphic designer Saul Bass) on the jets' tails (logo was later altered to red; see photo of 747). The marketing slogans adopted in 1968 and employed for about a decade were, "The Airline That Pride Built" and, "The Proud Bird with the Golden Tail.". Throughout the Vietnam War Continental provided extensive cargo and troop transportation for United States Army and Marine Corps forces to Asian and the Pacific bases. Continental's 707s were the most common non-military aircraft transiting Saigon Tan Son Nhat airport. As a result of Continental's experience in Pacific operations, the carrier formed subsidiary Air Micronesia in May 1968, inaugurating island hopping routes between Yap /Saipan /Guam , Majuro , Rota, Truk , Ponape (Pohnpei ) and Honolulu. "Air Mike", as it was known, initially operated with Boeing 727-100 aircraft specially outfitted with open-ocean survival gear, doppler radar, and a large complement of spare parts (including tires). A senior mechanic flew aboard every Air Mike flight until the late 1970s. Air Micronesia now operates as subsidiary Continental Micronesia. September 1969 saw the realization of a long-cherished goal: introduction of Continental service from Los Angeles to Honolulu /Hilo ; and in 1970, Continental was awarded routes from the Seattle and Portland to San Jose , Hollywood-Burbank Airport , and Ontario , California—all rapidly growing airline markets. Nonstop San Francisco to Albuquerque and Dallas services were added in the same year . In 1963, Continental hired the first African-American pilot to work for any major carrier in the United States, Marlon D. Green, after a United States Supreme Court decision allowed a Colorado anti-discrimination law to be applied to his case against Continental. Green flew with Continental Airlines for 13 years, between 1965 until his retirement in 1978. Continental's hiring of Marlon Green paved the way for the hiring of minority pilots by all U.S. carriers, an industry milestone which was finally realized in 1977 after Southern Airways and Piedmont hired their first minority pilots. At Six's insistence, Continental (with Pan Am and Trans World Airlines) was a launch airline for the Boeing 747 aircraft. On June 26, 1970 Continental was the first carrier to introduce the 747 into U.S. domestic service. Its upper-deck first class lounge and main deck "Polynesian Pub" won awards worldwide for the most refined cabin interior among all airlines, as did meal services developed by Continental's Cordon Bleu-trained executive chef, Lucien DeKeyser. Continental's 747 services from Chicago and Denver to Los Angeles and Honolulu set the standard for service in the western U.S. When asked by one Denver customer service agent in 1974 why he flew Continental wherever he could, Hollywood legend Henry Fonda remarked, "This operation is class; strictly class!" On June 1, 1972 Continental's widebody DC-10 service began. Six had insisted that Continental place a large order for DC-10s with manufacturer McDonnell Douglas. This decision again proved prescient, since the publicity associated with Continental's splashy 747 service in the Chicago-Denver-Los Angeles-Honolulu backbone corridor had stimulated not only increased market share, but increased traffic for all carriers in the markets. Additionally Denver , Houston and Seattle were experiencing very rapid growth. The DC-10s quickly assumed most of the duties of flying between Denver and Chicago, Los Angeles, Houston and Seattle (and between Houston-Los Angeles). During the 1970s, Denver continued to be the central hub of the Continental system. The 747s were focused on the Chicago-Los Angeles-Honolulu routes, with a single daily round trip through Denver. The DC-10 aircraft operated in large inter-city markets (usually from Los Angeles to Chicago, Denver, Houston and Honolulu; and from Denver to Chicago, Los Angeles, Seattle and Houston). DC-9 and B-727 types predominated over the rest of the system, as well as supplementing frequencies in the DC-10 markets. Next to Braniff, Continental operated fewer aircraft types (four: the B-747, DC-10, B-727-200, and DC9-10) during this period than any U.S. trunkline, affording substantial savings in parts, maintenance, and crew training logistics and costs. The DC-10 enabled the airline to capitalize on the burgeoning traffic growth in western U.S. markets. Continental saw market share grow annually in each DC-10 market through the 1970s, until relative market parity was achieved with United, the principal competitor on most of the DC-10 routes. The same service innovations introduced to the 747 fleet were initially implemented on the DC-10s, including the "Polynesian Pub"; although after the 1973 oil crisis-induced fuel price increases, higher seating capacity was needed to achieve profitable economics, and the DC-10 pubs would be removed. Continental phased out its 747s in favor of the DC-10s. From the mid seventies until it was merged with Texas International, the airline operated just two types of aircraft, the DC-10 and the 727. According to Six biographer Robert Serling, quality was the watchword in every detail of the Continental's operations in the 1960s and 1970s. In one anecdotal indication of Six's passion for premium customer service, every page of the airline's Customer Service Manual was inscribed with these words: "Nothing in this manual supersedes common sense." Bob Six relentlessly prowled the Continental system, as well as competitors' flights, to assure tight quality standards and to search for ideas that could be adopted to Continental's network. The airline credits Six with instituting a culture promoting customer service. From 1961 to 1982, Continental was headquartered at the western end of the Los Angeles International Airport property. The facility included the general offices, flight control, central maintenance facility, flight kitchen, and Los Angeles crew bases. In 1974, after years of delays and legal proceedings, Continental inaugurated service between Houston and Miami , and on May 21, 1976, Continental was authorized to operate between San Diego and Denver --both routes had been long-sought, and signaled a new era of rapid growth for Continental. President Jimmy Carter and Civil Aeronautics Board chairman Alfred Kahn had been promoting deregulation of the airline industry (see Airline Deregulation Act), which would dissolve the CAB and for the first time in industry history allow U.S. carriers to determine without government supervision where they would fly, and how much they could charge for their services. In this context, 1977 was an historic year for Continental and the industry at large, as the CAB began to loosen its regulatory grip. Continental began service from Denver to Miami /Ft. Lauderdale and Tampa /St. Petersburg. In that same year, President Jimmy Carter authorized Continental to begin daily round trips between Air Micronesia destination Saipan and Japan , and approved a route for Continental from Los Angeles to Australia via Honolulu , American Samoa , Fiji , New Zealand and Australia. The South Pacific service began May 1, 1979. After the 1978 passage of the Airline Deregulation Act, Continental embarked on an aggressive program of route expansion. October 1978 saw Continental begin flights from the New York area airports to Houston and Denver , and from Denver to Phoenix . That same month, Continental inaugurated DC-10 service between Los Angeles and Taipei , via Honolulu and Guam . Service between Houston and Washington D.C. began in January 1979. In June 1979, Continental linked Denver with Washington D.C., Las Vegas , San Francisco and San Jose and also began Houston -Tampa service. The airline suffered in 1979 when the DC-10 was grounded, nation wide. Given that Continental Airlines only operated the DC-10 and the 727 at the time, flights to Hawaii were cancelled, during the grounding. By the time of the Texas Air Corp. acquisition in 1981, Continental's post-deregulation growth had allowed it to penetrate every major U.S. airline market (and all of the regional markets) from the hubs in Denver and Houston; and the rapid expansion in the air was answered with large-scale facilities expansions at each of these airports. In Denver, Continental's very rapid growth provided the final impetus for the construction of the new Denver International Airport , which would be completed almost fifteen years later. During 1978, Continental explored the possibility of a merger with Western Airlines. Western was also headquartered at Los Angeles International Airport (LAX ) and operated a fleet consisting predominantly of the same B-727 and DC-10 aircraft types as Continental. The route systems would have been complementary, with little overlap; because, although they both served the Western states, Continental had strength in Hawaii , southern-tier and the Great Plains states; Western's strengths were in the California intrastate market, Alaska , Mexico , and the intermountain West. Both airlines served the Pacific Northwest and Rocky Mountain states, but along different routes from Los Angeles , Denver , San Francisco , Seattle and Phoenix . This merger was not consummated, however, and industry changes were to take Continental down a very different path. Unlike some airlines (notably Braniff whose expansion was so rapid and unsustainable that the additional costs made investment recovery impossible, and the carrier was forced into bankruptcy and liquidation), Continental's rate of expansion following passage of the Airline Deregulation Act seems, in retrospect, to have been appropriate. The markets that were added were almost all profitable, and formed a strong financial base for the wrenching challenges which the company would face between 1982 and 1994. In 1981 Texas Air Corporation, an airline holding company controlled by U.S. aviation entrepreneur and raider Frank Lorenzo, acquired Continental after a contentious battle with Continental's management who were determined to resist Lorenzo. Continental's labor unions also fiercely resisted, fearing what they termed as, "Lorenzo's deregulation tactics," which meant that he wanted to make Continental a non-union airline. During this struggle, Continental Airlines President, A. L. Feldman, committed suicide, on August 9, 1981, in his office. In the end, Texas Air Corp. prevailed. Frank Lorenzo became Continental's new Chairman and CEO. On October 31, 1982 Continental merged with Texas International (the merged carrier retained the Continental name, brand, and identity; the TI brand and identity disappeared), offering service to four continents (North and South America, Asia and Australia) with a fleet of 112 aircraft. The "new Continental" relocated its headquarters to Texas Air's base in Houston, Texas. The merger resulted in a large expansion of Continental's hub at Houston Intercontinental Airport and extensive new routes to Mexico and the south central U.S. Airline unions fought Lorenzo and Continental at every step. In the Federal courts, they unsuccessfully sued to stop the company's reorganization. They were successful in working to persuade Congress to pass a new bankruptcy law preventing bankrupt companies from terminating contracts as Continental had successfully done. The law was too late to affect Continental and the cost cutting and changes that had rescued it from liquidation. On July 1, 1983 the airline's headquarters were located at the America Tower in the Neartown area of Houston, and would remain there until relocation to downtown in 1998. Frank Lorenzo took Continental into Chapter 11 bankruptcy on September 23, 1983, after unsuccessfully attempting to negotiate a lower pay rate with labor unions. Rebuilding the company began immediately. Following bankruptcy, Continental was freed of its contractual obligations and imposed a series of new labor agreement on its union workers, sharply reducing the airline's labor costs at the cost of employee morale. This move made Continental vastly more competitive with the new airline startups then emerging and thriving in the southwestern U.S., but had notable negative impact on employee attitudes and loyalty. In financial terms, the airline's decision to take bankruptcy worked—by the end of 1984, Continental recorded a $50 million profit. On June 30, 1986, Continental emerged from the Chapter 11 bankruptcy. Continental has the distinction of being the first U.S. airline to fly through bankruptcy. On April 28, 1985, Continental began its rebound, as signaled by the inauguration of its first ever scheduled service to Europe with flights from Newark and Houston to London . Soon thereafter, services to Paris , Frankfurt , Madrid and Munich were added. In October 1985, Texas Air Corp. made an offer for a Denver-based regional carrier, Frontier Airlines, opening a bidding war with People Express, which was headed by Lorenzo's former TI associate Don Burr. PeopleExpress paid a substantial premium for Frontier's high-cost operation. The acquisition, funded by debt, did not seem rational to industry observers from either the route integration or the operating philosophy points of view, but was in the opinion of most industry analysts rather an attempt by Burr to best his former boss, Frank Lorenzo. On August 24, 1986, Frontier filed for bankruptcy and ceased operations. With People Express hemorrhaging cash, Texas Air acquired PeopleExpress on September 15, 1986, at the same time gaining Frontier whose strong network in the Great Plains and intermountain West reinforced Continental's already formidable Denver hub. Because it had been the largest airline operating in the New York market, the PeopleExpress hub at Newark would permit Continental to expand its east coast services dramatically for the first time in its history. Continental soon became the third-largest airline in the U.S., and the predominant force in the New York, Denver and Houston airline markets. Continental emerged from bankruptcy in 1986 with improved asset and cash flow positions and a more competitive route structure with routes radiating to every large U.S. city from major hubs at Denver and Houston. On February 1, 1987, People Express, Frontier, New York Air, and several commuter carriers were merged into Continental Airlines to create the third-largest U.S. airline (and sixth largest airline in the world). In so doing, Continental became an even larger player in the northeastern markets. 1987 saw the creation of Continental's OnePass frequent flier program (jointly with Eastern Airlines); and, in 1988 Continental formed its first strategic partnership (and the first international airline alliance of its kind) with SAS. In 1990, Frank Lorenzo retired after 18 years at the helm of Texas International and later Texas Air and Continental Airlines, selling the majority of his Jet Capital Corporation to Scandinavian Airlines System . According to William F. Buckley, in his September 17, 1990 article on National Review, the sale to SAS was conditioned on Lorenzo leaving the company. On December 3, 1990, Continental filed for its second bankruptcy in a decade. There were a number of circumstances behind the second bankruptcy, most importantly: Lorenzo had dedicated himself almost full time to Eastern Air Lines acquisition and labor relations issues; the 1990 Iraqi invasion of Kuwait and the resultant Gulf War had prompted a dramatic increase in the price of jet fuel; and People Express had also been highly leveraged at the time of its merger with Continental, having purchased Frontier Airlines just two years before. In addition to Lorenzo embarking on deals which saddled the airline with other carriers' debts, he also began consolidating the different airlines into one system. That resulted in a fleet comprising numerous aircraft types, evident in the patchwork array of liveries in the Continental fleet that lasted until Gordon Bethune order all planes to be painted into the current livery. In the late 1980s, following a dramatic reduction of service by United Airlines and an unsuccessful attempt by USAir to establish point-to-point service, Continental expanded at Cleveland Hopkins International Airport and established what would become its third-largest system hub. Continental quickly gained nearly all of the gates in the airport's C concourse (once dominated by United), and later expanded that concourse in addition to constructing a new Concourse D.
On February 12, 1991, Continental unveiled its new blue and gray livery and the "globe" logo. These continue to be the identity for Continental's fleet and facilities identification. In 1993 Air Canada, Air Partners and Texas Pacific Group, enabled Continental to emerge from bankruptcy by investing $450 million in the airline. Under the leadership of former Boeing executive Gordon Bethune, who became President in October 1994, Continental began a substantial work of re-invention. When Bethune took over in 1994 as COO and President of Continental Airlines the troubled airline had twice faced bankruptcy and was again headed that direction. A search firm hired by Continental's board of directors suggested Bethune, who had recently completed an Advanced Management Course at the Harvard Business School, to salvage the company. Bethune quickly made his mark on the carrier recognizing that a good airline was defined by customer satisfaction, not just cost per available seat mile. Bethune ascended to the role of CEO and was elected chairman of the board of directors in 1996. Continental went from being ranked last in every measurable performance category to winning more J.D. Power and Associates awards for Customer Satisfaction than any other airline in the world. BusinessWeek magazine named Bethune one of the top 25 Global Managers in 1996 and 1997. Under his leadership Continental's stock price rose from $2 to over $50 per share. Fortune magazine named Continental among the 100 Best Companies to Work for in America for six consecutive years. In his final year piloting the airline Fortune magazine ranked Continental 2004's No. 1 Most Admired Global Airline, a title it earned again in 2005, 2006, 2007 and 2008. Bethune released his book, From Worst to First., in 1999 detailing his success at that carrier. While at Continental, Mr. Bethune created the Go-Forward plan, to fix problems with the airline, which included employee morale, the quality of the product, and the route structure, among others. He is credited, along with his management team, for saving Continental from extinction.Bethune began by ordering new aircraft in an effort to convert to an all-Boeing fleet. After the opening of Denver International Airport on February 28, 1995, Continental management decided that the Denver hub - its historic operational base and heart of the system for almost 60 years - would be abruptly reduced to spoke status (with service only to Houston, Newark, and Cleveland). This decision centered on cost-reductions, since DIA charges and landing fees were substantially higher than those at Stapleton , which DIA had replaced. On March 26, 1996 Continental launched the first phase of its website. During this time period Continental was the subject of hostile takeover bids submitted by then Delta Airlines and Northwest Airlines. The final deal struck, as described by Bethune in his book, with Northwest allowed Continental to keep it's corporate identity but all major decisions, mergers and alliances, were controlled by means of a "golden share" owned by Northwest Airlines. In January 1997 Continental occupied 250,000 square feet of space at the America Tower . In addition it had 200,000 square feet of office space in a building in proximity to George Bush Intercontinental Airport and 75,000 square feet in a building located on Fuqua Road in Houston. The airline planned to move into a new headquarters site; originally it wanted a single site for its operations. 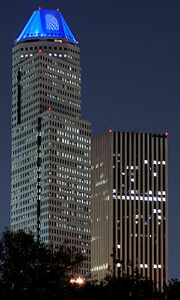 In September 1997 the airline officially announced that it would consolidate its Houston headquarters in Continental Center I in Downtown Houston. The airline scheduled to move around 3,200 employees in stages beginning in July 1998 and ending in January 1999. The airline consolidated the headquarters operation at the America Tower and three other local operations into Continental Center I and Continental Center II in the Cullen Center. Bob Lanier, Mayor of Houston, said that he was "tickled to death" by the airline's move to relocate to Downtown Houston. Beginning in 1998, Continental again embarked on a program to expand its international operations. In that year it inaugurated services to Ireland and Scotland , and in October 1998 the airline received its first Boeing 777-200ER aircraft, allowing non-stop flights from Newark and Houston to Tokyo, Japan , and from Newark to Tel Aviv, Israel . Continental in the same year launched partnerships with Northwest Airlines, Copa, Avant Airlines, Transbrasil, and Cape Air, and Continental and America West Airlines became the first two US airlines to launch interline electronic ticketing. On March 1, 2001, Continental launched non-stop service from Newark to Hong Kong , operating over the North circumpolar route. This service was the first non-stop long-haul route for any airline with flying duration exceeding 16 hours. The SARS outbreak in Asia caused service to be suspended until August 1, 2003. The launch in 2001 initiated a brief battle between Continental, United Airlines and Cathay Pacific over rights to non-stop flights between Hong Kong and New York. On September 13, 2004 Continental entered SkyTeam alliance along with Northwest/KLM and CSA. Continental introduced new non-stop services to Oslo , Norway and Edinburgh,Scotland in 2004. In 2005, Continental expanded service from Newark to Beijing after being awarded the China route. During the same year, five new European destinations were added: Stockholm in Sweden, Belfast and Bristol in the United Kingdom, and Hamburg and Berlin in Germany. Service was added to Cologne, Germany in 2006 and to Athens , Greece in 2007. Among U.S. airlines, only Delta (with its extensive network of legacy routes dating from Delta's acquisition of Pan American's European network) serves more European destinations than Continental. In 2005 service to Asia was expanded as Continental introduced daily nonstop service between Newark and New Delhi , India. The success of this Newark-New Delhi route presaged establishment of a second gateway in India with the announcement of daily nonstop service to Mumbai . With the establishment of Mumbai service, Continental offers the most nonstop flights by any carrier from the United States to India. By May 2006, the carrier's passenger traffic surpassed that of Northwest Airlines, and Continental became the fourth-largest U.S. carrier, the first change in the top-five passenger enplanement rankings since 2001. The Wall Street Journal reported on December 12, 2006 that Continental was in merger discussions with United Airlines. Of issue would be Continental's golden share held by Northwest Airlines, dating from a stakeholding relationship during the late 1990s, and the divestiture of Continental's Guamanian hub. A deal was not "certain or imminent", with the talks being of a preliminary nature. In April 2008, at the height of oil prices, Northwest announced a merger with Delta Airlines. This allowed Continental to buy back the golden share from Northwest Airlines, which it did. Continental then renewed merger talks with United Airlines, but Continental ended the merger talks that same month. In May 2008, Continental Airlines sold its remaining 4.38 million share investment in Panamanian flag carrier Copa for $35.75 a share, netting proceeds of $149.8 million. Continental had been a principal shareholder in Copa. Continental said on June 5, 2008 that due to national and international economic conditions, it would cut 3,000 jobs and that the CEO and president would reduce their salaries for the remainder of the year. The airline also said it would reduce capacity and eliminate 67 mainline aircraft from its fleet by the end of 2009, retiring all of Continental's 737-300s and all but 35 of its 737-500s. On June 19, 2008, Continental announced that it planned to withdraw from the SkyTeam Alliance and would join the Star Alliance in order to cooperate more extensively with United Airlines and other Star Alliance airlines. The new Continental-United relationship has been characterized as a "virtual merger" in some circles. Continental had maintained its SkyTeam affiliation to be business-as-usual until the day of withdrawal.filler Continental had been in discussions with United Airlines earlier in 2008 which might have resulted in a merger of the two carriers, but Continental withdrew from these discussions stating that it intended to continue to operate as presently constituted. On August 19, 2008 The USA Today reported that Continental would furlough between 140 to 180 pilots. The article also mentioned that more than 2,500 jobs have already been eliminated, mostly by voluntary early out programs. Continental said in June that it would reduce U.S. capacity by 11% after the end of the peak summer travel season. In September 2008, Continental announced that it would commence providing seasonal non-stop service between Houston and Rio de Janeiro . The new non-stop flight is timed to provide roundtrip flight connections at Continental's Houston hub to more than 160 cities throughout the U.S., Canada, Central America, Europe, and Asia. In September 2008 Continental renewed its lease for around in Continental Center I . Before the lease renewal, rumors spread stating that the airline would relocate its headquarters to office space around George Bush Intercontinental Airport due to high fuel costs affecting the airline industry; the rumors stated that the airline was studying possibilities of less expensive alternatives to Continental Center I. On January 7, 2009, Continental conducted the first biofuel-powered demonstration flight of a U.S. commercial airliner. The demonstration flight was powered by a special fuel blend including components derived from algae and jatropha plants - sustainable, second-generation fuel sources that do not impact food crops or water resources and do not contribute to deforestation. On January 29, 2009, Continental announced that its 4th quarter 2008 net loss widened to $266 million on costs for pilot retirement and reducing the value of its fuel hedges. On July 10, 2009, the U.S. Department of Transportation (DOT) approved the application for Continental to join the existing antitrust immunized alliance including United Airlines and eight other Star Alliance member carriers. In addition to United, the eight Star Alliance members that have been granted DOT approval for antitrust immunity are Air Canada, Austrian, bmi, Lufthansa, LOT Polish Airlines, Scandinavian Airlines (SAS), SWISS and TAP Portugal. On July 16, 2009,Larry Kellner announced that he will be stepping down as CEO at year-end (2009) to return to the private-equity business and will be replaced by company president Jeff Smisek. Smisek will be taking full control as of Jan. 1st, 2010. Continental, together with Continental Express and Continental Connection, offers more than 3,100 daily departures throughout the Americas, Europe and the Asia-Pacific region. The summer 2008 schedule saw Continental serving 133 domestic and 132 international destinations with more than 550 additional points served via SkyTeam alliance partner airlines. Continental Airlines operates primarily a hub-and-spoke route network with North American hubs in Cleveland, Houston, and Newark, and a west Pacific hub in Guam. The majority of Continental flights are operated from its hubs, with a few exceptions (Seattle-Anchorage, Los Angeles-Honolulu, and Los Angeles-Havana). Some affiliated airlines using the Continental Connection name also operate flights not involving hubs, such as Gulfstream International Airlines, which operates intra-Florida and Florida-Bahamas services. To commemorate Continental's 75th Anniversary, Boeing 737-900ER aircraft N75436 was painted with Continental's mid-50s "Blue Skyways" livery. For almost 40 years, Continental operated a very large hub in Denver, Colorado , but took the decision to close that hub in 1995 immediately after the opening of Denver International Airport (D.I.A). D.I.A. represented a significantly higher-cost operation than the former Stapleton Airport, which D.I.A. had replaced. The abrupt nature of this change came as a shock to Denver, which was experiencing dramatic growth. The void left by Continental's departure allowed the establishment of the "new" Frontier Airlines (a startup, rather than the original carrier of that name). Both Frontier and Southwest Airlines (which entered the Denver market after Continental's dehubbing) have expanded quickly to fill the vacuum created by Continental's closing of its Denver hub. For the first forty years of its existence, Continental was a domestic airline; however, especially after the incorporation of Texas International routes, it has served more Mexican destinations than any other U.S. carrier since the mid-1980s. Continental first entered the transatlantic market in April, 1985, with the introduction of a Houston-London Gatwick service. Long prevented from serving London-Heathrow because of the provisions of the Bermuda II agreement, Continental has maintained its London services at London-Gatwick , where in 2007 as many as six flights a day were offered to Newark, Houston, and Cleveland. In March 2008, an Open Skies Agreement between the U.S. and the European Union became effective, invalidating Bermuda II restrictions that had limited the number of carriers and cities in the U.S. that could serve London-Heathrow . In November 2007 Continental announced that new, nonstop, twice-daily service from its hubs at Houston-George Bush Intercontinental and Newark-Liberty to London-Heathrow would be offered; and this service was inaugurated on March 29, 2008. The service replaced existing frequencies to London-Gatwick and are offered with a combination of Boeing 777-200ER and 767-200ER equipment. During the Vietnam War, Continental's extensive military charter operations established a presence in the Pacific region that formed the basis for the Air Micronesia operation. Service to Japan was initiated in the 1970s from Guam and Saipan, and by the late 1980s, nonstop service between Seattle and Tokyo was briefly offered with 747 equipment, soon to be replaced with a direct Honolulu-Tokyo flight. Through the 1990s, Continental maintained a minimal presence in the long-haul trans-Pacific market, until the delivery of 777-200ERs in 1998 which saw the addition of nonstop Tokyo service from Houston and Newark. By 2007, Hong Kong and Beijing were added to the network, and in 2009 Shanghai was added, all from the Newark hub. Continental has served Australia in the past with Douglas DC-10 and Boeing 747 service from Hawaii; Continental withdrew from much of the Australian market, but continues Air Micronesia Boeing 737-800 services between Cairns and Guam on a 2x weekly basis. Continental offers the most scheduled frequencies of any of the U.S. carrier to India, Japan, Mexico, Ireland and the United Kingdom, and is the only U.S. airline to fly to the Federated States of Micronesia , Marshall Islands , and Palau . Continental began service from Newark to Mumbai , India on October 1, 2007 making that city Continental's second Indian destination. Continental is considering routes from its hub in Houston to Dubai, Rome, Milan, and Madrid which are planned to commence when it takes delivery of 787 aircraft after 2010. Continental announced on June 12, 2008 that it would end service to fifteen destinations as part of efforts to trim costs. The airline closed its gates and ticket counters in each of these airports. Service to the following cities was discontinued: Denpasar, Bali, Indonesia ; Cali, Colombia ; Cologne, Germany; Guayaquil, Ecuador ; Monclova, Mexico ; Santiago, Dominican Republic ; Oakland, California ; Palm Springs, California ; Reno, Nevada ; Sarasota, Florida ; Tallahassee, Florida ; Green Bay, Wisconsin ; Chattanooga, Tennessee ; Toledo, Ohio and Montgomery, Alabama . As worldwide passenger traffic contracts as a result of economic conditions, service to other destinations may also be reduced or eliminated from Continental's hubs in Newark, Houston, Cleveland and Guam. Travelers at Houston and Cleveland are expected to be hardest hit by the planned service reductions. Continental's all-Boeing fleet had an average age of 10.2 years as of April 2008. The fleet consists of four types (Boeing 737, 757, 767, and 777) in eleven variants, with two variants of the Boeing 787 Dreamliner scheduled to enter service in 2011. Continental has consistently been the most efficient trunkline operator of jets since they came on the aviation scene. The company's daily aircraft utilization is usually at the top of the industry. Largest operator of the Boeing 757-300. Currently retrofitting with blended winglets. 2 dry leased from ILFC. *First Class is offered on Domestic Flights. BusinessFirst is offered on Transatlantic/Transpacific Flights. Continental Airlines was one of three carriers (with American Airlines and Delta Air Lines) to sign an exclusivity agreement with Boeing in the late 1990s. When Boeing acquired McDonnell Douglas, the European Union forced Boeing to void the contracts. Both parties have been adhering to the terms under a gentlemen's agreement. Continental Airlines has a two-class service configuration, First/BusinessFirst and Economy Class, for aircraft in the mainline fleets. Continental's recently announced and has begun deploying BusinessFirst seats that allows customers to lie completely flat, reclining 180-degrees and providing 6 1/2 feet (2 m) of sleeping space in the fully extended position on its widebody aircraft. The lie-flat seat will offer a seat measuring up to wide when the adjustable armrest is positioned flush with the seat cushion. Electronic "one-touch" controls will enable customers to easily move the seats to pre-set upright, cradle and fully extended sleep positions and additional controls allow customers to adjust the seat back, lumbar support and leg and foot rests. iPod connectivity will also be available in the new Business Class at the seat. The new BusinessFirst seats will also have a six-way adjustable head rest, an individual overhead reading light and an adjustable seat light allowing a Business Traveller to read in bed without disturbing their neighbour and a privacy shell that allows for seclusion from other travelers. BusinessFirst customers also receive one of the highest crew to passenger ratios (1:8). The new BusinessFirst seats are currently on one of Continental's Boeing 777 aircraft and is being installed on others. The anticipated completion of the roll-out across Continental's entire international fleet is August 2012. Domestic First Class is offered on domestic flights. It is available on all Boeing 737 family aircraft, as well as Boeing 757-300 aircraft. Seats range from 20.75 to wide, and have between 37 and of pitch. Passengers aboard this class receive free meals, refreshments, and alcoholic beverages. Passengers can watch movies on overhead TV screens located throughout the cabin. Beginning in 2009, Continental plans to add LiveTV television and Wi-Fi services to all next-generation Boeing 737s and Boeing 757-300s which will be free of charge to First Class customers. Economy Class is available on all international flights. Seats range from 17.2 to wide, and have between 31 and of pitch. Passengers aboard this class receive free meals, snacks, and non-alcoholic beverages; alcoholic beverages can be purchased for five United States dollars per drink or one Continental Currency coupon per drink. Economy Class is available on all domestic flights. Seats are wide, and have between 31 and of pitch. Passengers aboard this class receive free meals, snacks, and non-alcoholic refreshments. Alcoholic beverages may be purchased on board. Passengers on select Boeing 737-300, most Boeing 737-700, -800, -900, -900ER, and all 757-300 aircraft can watch movies on overhead television screens located throughout the cabin, with headsets available at a charge. In January 2009, Continental began to add LiveTV television and Wi-Fi services to all next-generation Boeing 737s and Boeing 757-300s. LiveTV will be chargeable for Economy Class customers, while the Wi-Fi service will reportedly be complimentary. Continental's LiveTV Seat Controls aboard a Boeing 737-900ER. 757-200 and 777-200ER aircraft include Audio-Video On-Demand (AVOD) in every seat back. Boeing 767 family aircraft are equipped with a personal television located in every seat back, using a tape system. On all Boeing 757-200 and AVOD Boeing 777-200ER aircraft, all rows are equipped with power-ports (two power ports per group of 3 seats) that do not require special power adapters or cables. Continental's LiveTV System aboard a Boeing 737-900ER. Airlines Inc. says it will offer 75 channels of live television to all passengers on its Boeing 737 700s, 800s, 900s, and 900ERs and Boeing 757-300s, starting in January 2009. Continental also said it would introduce onboard Wi-Fi services including e-mail and instant messaging, subject to LiveTV being able to offer the service, which is in testing. A growing list of carriers are planning or testing such services. The TV lineup  includes CBS, NBC, Fox News, CNN Headline News, ESPN, Discovery, Disney and additional movie channels. The service becomes available "appoximately 15 minutes after the doors close (main-cabin door)". Movies start at a set time and cannot be paused, rewound or fast-forwarded. The service is free to first-class passengers and is available for a charge in the coach cabin. Service becomes limited during descent. As of October 18, 2009, all 29 Boeing 737-900ERs have been complete. Work has been begun on the 108 Boeing 737-800s. Expected completion is by October 2010. Established in 1987 in cooperation with now defunct Eastern Airlines, OnePass is the frequent flyer program for Continental Airlines, Copa Airlines and AeroRepública. OnePass offers regular travelers the privilege to obtain free tickets, First Class upgrades on flights, discounted membership for its airport lounge (President's Club), and other types of rewards. Customers accumulate miles from flight segments they fly or through Continental Airlines partners. OnePass elite tiers are Silver, Gold, and Platinum Elite which have benefits such as free upgrades, mileage bonus, priority check-in, priority boarding, and much more. Continental previously had a frequent flyer program prior to OnePass, which was started not long after American Airlines started its frequent flyer program in 1981 and when most large United States airlines followed, but this was merged with Eastern Airlines' frequent flyer program in 1987 to form OnePass. The name "OnePass" refers to the ability to accumulate miles on two major airlines, namely Continental and Eastern, in one frequent flyer program. The Presidents Club is the membership airport lounge program of Continental Airlines, Copa Airlines and AeroRepublica. The clubs all have open bars, but have also started a premium bar service where higher end wines and alcohol can be purchased. Continental was the first airline to offer free wi-fi in their lounge. There are 25 clubs throughout the world and members have full reciprocal privileges at over 40 additional locations including lounges operated by selected Star Alliance partners including United Airlines and Lufthansa . The Presidents Club offers lifetime memberships, something that as of November 2008 costs non-elite OnePass members $5,500. BusinessFirst customers flying an international itinerary as well as International Business Class customers are allowed access to the clubs. BusinessFirst customers may bring up to two guests and Presidents Club members may bring two guests or their immediate family (spouse and children under 21 years of age). American Express Platinum and Centurion card members are granted access to Presidents Clubs if they are flying on a Continental operated flight that day under a Continental flight number. At airport kiosks Continental Airlines allows customers to buy "Continental Currency", a prepaid credit for audio headsets and alcoholic beverages on flights. CommutAir operates mostly from Continental's Cleveland and Newark hubs. Colgan Air operates out of Houston and Newark. Colgan, as a subsidiary of Pinnacle Airlines Corp. operates out of Newark out of Houston as 'Continental Connection'. Cape Air operates (Continental also has a codeshare with the mainstream Cape Air) in Southern Florida and from Guam to Saipan, Saipan to Rota and Rota to Guam. Gulfstream International Airlines operates in the Bahamas, Miami, Ft. Lauderdale, Orlando, Tampa, and West Palm Beach, Jacksonville, Fort Walton, Tallahassee, Fort Myers, Key West, and Sarasota. Continental Airlines has made many efforts to minimize the negative environmental effects of commercial aviation. It has made substantial progress in modifying operational activities to reduce environmental impact; for example, the carrier invested over $12 billion for the purchase of the current 270 fuel-efficient aircraft and related equipment that make up part of the airline's fleet. These efforts have contributed to significant reductions of greenhouse gas and noise emissions, and have decreased fuel consumption by 45% per mainline revenue passenger mile over the past decade. Continental Airlines was also one of the first carriers in the world to fit winglets to as much of their fleet as they could, reducing fuel burn by 3-5%. Continental has implemented a program that gives passengers the opportunity to offset their carbon emissions per flight for a fee of $2. Funds collected from the carbon offset scheme are directed for tree planting in reforestation areas. Passengers can also contribute $50 dollars or more to fund renewable-energy projects such as wind- or solar-power projects, or to re-establish algae in oceans or large scale reforestation. The U.S. Environmental Protection Agency's (EPA) "Design for the Environment Program" has recognized Continental (2008) for use of a non-chromium aircraft surface pre-treatment that is environmentally compatible. Continental Airlines is the first carrier in the world to utilize this technology on their aircraft. The product, "PreKote", eliminates hazardous chemicals that are usually used in the pre-treatment phase before painting an aircraft. This technology provides improved environmental conditions for maintenance employees, while also reducing wastewater. Continental Airlines is planning flight tests using aircraft powered by biofuel rather than traditional Jet-A1. On January 7, 2009, Continental partnered with GE Aviation to conduct a biofuel demonstration flight, making the airline the first U.S. carrier to conduct tests using biofuels. The test bed, a Boeing 737-800 (registered as N76516), ran one of its engines on a mix of 50% kerosene, 6% algae, and 44% jatropha, a weed that bears oil producing seeds. The engine running partly on biofuel burned 46 kg less fuel than the conventional engine in 1 and a half hours while producing more thrust using the same volume of fuel. Continental's CEO, Larry Kellner, commented "This is a good step forward, an opportunity to really make a difference to the environment" citing jatropha's 50-60% lower CO2 emissions as opposed to Jet-A1 in its lifecycle. Continental Airlines has been recognized by NASA and Fortune Magazine for positive environmental contributions. The following are major incidents and accidents that have occurred on Continental Airlines mainline aircraft. On July 1, 1965 Continental Airlines Flight 12 ran off the runway at Kansas City Downtown Airport landing in heavy rain. All 66 on board survived. On October 28, 2006, Continental Flight 1883, a Boeing 757-200 aircraft carrying 160 passengers, landed on a narrow unoccupied taxiway parallel to runway 29 at Newark Liberty International Airport . No one was injured and both pilots were removed from flying status duties pending an investigation. They have since been reinstated. Potentially confusing runway lighting and pilot error were cited in the investigation. In January 2007, a Continental Boeing 757 pilot died en route from Houston to Puerto Vallarta, Mexico. The flight was diverted to McAllen, TX. On June 18, 2009, the captain of Continental Airlines Flight 61, a Boeing 777-200ER, en route from Brussels, Belgium, to Newark, New Jersey, died of natural causes during the trip. The airline alerted federal authorities around 10:30 that morning that Flight 61 was being flown by the co-pilot and relief pilot. The plane with 247 passengers aboard landed safely at Newark Liberty International Airport at about noon EDT. On August 3, 2009, Continental Airlines Flight 128, a Boeing 767-200ER, flying from Rio De Janeiro to Houston encountered severe turbulence, resulting in 26 injuries. The plane safely diverted to Miami. Continental Airlines, Customer Service Manual, 1970 edition.